Angus Wallam (Centre) unscrews the first crate of works from Colgate University, as Milton Jackson (Far Left) and Ezzard Flowers (Mid Right) look on. The ABC’s Message Stick program records the moment. Photograph by John Stanton, 27th February 2006. Courtesy of Berndt Museum of Anthropology, The University of Western Australia. There was great excitement in the Katanning Gallery as preparations were made to unscrew the lid of the first of several crates flown out from Colgate University, Hamilton, New York State, for the Perth International Arts Festival exhibition, Koorah Coolingah: Children Long Ago. The crates had sat acclimatising for several days in the darkened Gallery; it was now time to reveal their contents. Milton Jackson, the last surviving child artist, attended the occasion with his daughter Merlene Meade, along with Elder Angus Wallam, and Ezzard Flowers, who had travelled the previous year with Athol Farmer and myself to select the works for the exhibition. Kelrick Martin was directing the ABC film unit, recording a program for Message Stick, to be titled Carrolup Found. First one, then the lids of the other crates, were gently opened and removed, the fastening screws safely put away for the return journey. Each of the artworks had been mounted in dark wooden frames, and for travel each was wrapped in plastic and stored between thick sheets of cardboard, one on top of the other. 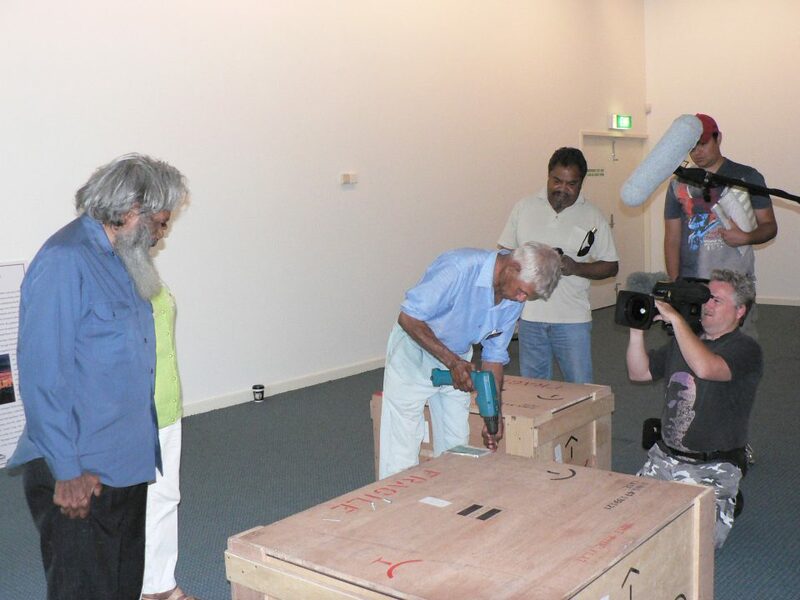 It was indeed a magical moment, to see the artworks emerge one by one from their crates, to touch Noongar boodja, Noongar land, for the first time in perhaps 55 years. The circle had been completed. Tears were close. I think some of us might even have forgotten to breathe, such was the excitement, and significance, of these moments. Milton (Micky) Jackson, the last surviving child artist from Carrolup, and his daughter Merlene Mead, start removing screws on the first crate of artworks on loan from the Picker Gallery, Colgate University, USA. The artworks will be exhibited for the Perth International Arts Festival (PIAF) Exhibition at Katanning, ‘Koorah Coolingah: Children Long Ago’. [Berndt Museum of Anthropology, The University of Western Australia] Filmed by John Stanton in Katanning, Western Australia, on 21st February 2006.